In order to secure the future of both our own organisation and the brass band tradition in the Rhondda as a whole, an innovative policy of training young people in the art of brass playing was adopted by the Parc & Dare Band and its committee in the form of the Parc & Dare Junior Band. The band also a participant organisation of the Cory Academy and members will be offered associated tutition and the opportunity to particpate in organised events. In the past theParc & Dare Junior Band have performed with groups from Zimbabwe, from St Kitts in the Caribbean, in Carnival with BBC Wales' weatherman Derek Brockway as well as appearing in supporting performances at numerous Parc & Dare Band events in venues which include the Wales Millennium Centre, the Coliseum Theatre, Aberdare, and Parc & Dare Theatre, Treorchy. Membership is open to all. Instruments, uniforms and tuition are provided by the band free of charge although members are asked to contribute the sum of £2 per week towards the upkeep of the bandroom, maintenance of instruments and the purchase of new music. Junior band member Carys Lewis took part in the URDD Eisteddfod held recently in Bala over May half term in what was a stiff compettion of 18 young players who qualified through a number of rounds to represent their areas of Wales. After an early start at the Competiton Field, Carys was successful in securing a place in the final round (which was televised by S4C), and eventually was awarded second place overall. In additon, she was joined by younger sister Kayleigh Lewis (also a memebr of the junior band) to take part in two other brass category finalist competitons. Well done both!. Junior band member Carys Lewis has won Treorchy Male Choir's "Young Musician of the Year 2014" competition. Twenty Primary school aged children took part in the final after winning through from semi-finals and preliminary rounds. 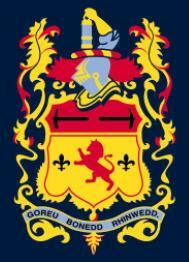 The competition took place in front of a packed audience at Treorchy Comprehensive School on Tuesday 2 April 2014. Carys chose to play an arrangement of "He ain't heavy-He's my brother" made famous by the Hollies on Tenor Horn and all her hard work paid off with a polished performance. Well Done Carys! The band is extremely please to anounce that have secured funding towards Junior Band instruments. On 17 January 2014 the band was presented with a cheque from the Treorchy Wind Fund to fund the purchase of instruments. The process of securing the funding included a public vote, and the band is indebted to the the people of the community who took part in the public vote to support the band's bid.